Chocolate Toffee Recipes are rich and delicious. I personally love that buttery flavor combined with the chewy nut filled centers and smothered in chocolate. What could be nicer? You can get some delicious chocolate covered toffee online. Here are a couple of really yummy choices if you want to treat yourself or someone you love. But why not make your own? 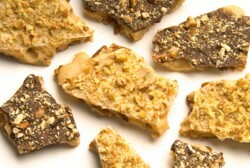 Try some of these chocolate toffee recipes and develop your own unique favorite chocolate covered toffee recipe, but don't be surprised if your toffee doesn't last long! Heat oven to 375 degrees. Line cookie 2 cookie sheets or jelly roll pans with foil. Grease the foil with butter flavored Crisco. In a heavy saucepan, combine Crisco, sugar, honey, and whipping cream. Heat at medium high heat until boiling, stirring constantly. Boil for 1 1/2 minutes, then remove from heat. Addnuts and stir until completely covered. Press mixture onto cookie sheets and spread out to about 1/4 inch thickness. Bake at 375 degrees for 8-12 minutes or until golden and bubbly. Cool for about 5 minutes before removing foil fromcookie sheet. Leave the toffee on the foil and allow to cool completely on waxed paper. To prepare glaze, melt chocolate and 2 tsp. Crisco in saucepan on low heat, or place in microwave safe bowl and microwave at medium heat in 1 minute intervals stirring every minute until melted and smooth. Allow to cool slightly. Peel foil from toffee. Spread chocolate over the smooth bottom. Cool completely and cut into squares. Sprinkle 1/2 cup of the nuts in a greased 9x12 pan. Melt butter in a saucepan. Add sugar and mix well. Boil for 12 minutes, stirring constantly. Add remaining nuts to hot mixture. Pour into pan. Place chocolate bars on top of mixture. When melted, spread chocolate, cut into squares and allow to cool. Butter a 9x9 square pan. Spread pecans in pan. Heat sugar and margarine to boiling in 1 quart saucepan, stirring constantly. Boil over medium heat, stirring constantly, for 7 minutes. Pour immediately into pan and spread evenly. Sprinkle chocolate chips over hot mixture. (cover with a cookie sheet to keep in the heat). When chocolate has melted, spread it over the candy. Cut into squares while still hot and thenrefrigerate until firm. Line cookie sheet with foil. Layer the graham crackers over the cookie sheet to cover completely. Cook butter, margarine, and brown sugar in heavy saucepan until dissolved (it will start to foam while boiling). Spread evenly over graham crackers. Bake at 350 degrees for 10 minutes. Place pieces of chocolate bars over the toffee and allow to melt. Spread evenly over surface. Sprinkle crushed nuts over the top and gently pat to fix them in place. Refrigerate or freeze until firm. Break into pieces. If you would like proper squares, score the lines before refrigerating. A greased pizza cut works great. Chocolate Toffee Recipes are fun to make. It is even more fun to eat the results! Store your toffee in an airtight container, a tin is great. Do you have other favorite chocolate toffee recipes that you would like to share? Add it here by filling out this simple form. Best Recipe Scout is proud to link to this site. Stop by our site and vote for your favorite recipe.